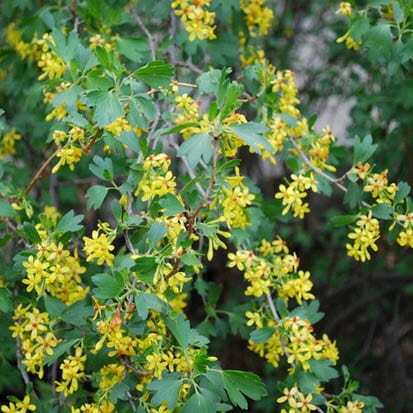 Clove currant is a Missouri native shrub which is most commonly found on limestone bluffs along the Current and White Rivers in southern Missouri. It is a thornless, loosely-branched, irregularly-shaped, deciduous shrub which grows 6-8′ tall and spreads by suckers. Ovate to rounded, medium to bluish-green, 3-5 lobed leaves turn dull yellow in fall. Golden yellow flowers appear in racemes in spring and emit a strong, clove-like fragrance (hence the species name of odoratum). A dioecious shrub which requires both male and female plants for fruit production. Fruit is an edible, black berry which can be used in jellies, preserves and pies.